Photo Electronics was founded by Giuseppe Zanardo in 1961, specializing in the production of electronic equipment for photographic laboratories. In 1966 was one of the first companies in Italy to manufacture ultraviolet light systems (with Xenon lamps, then Metallic Alogenes) and also exported to the USA. In 1976 with the opening of the Spare Lamps Center it was possible to find the largest number of UV lamps installed on most Italian and foreign systems, for Graphic Arts. 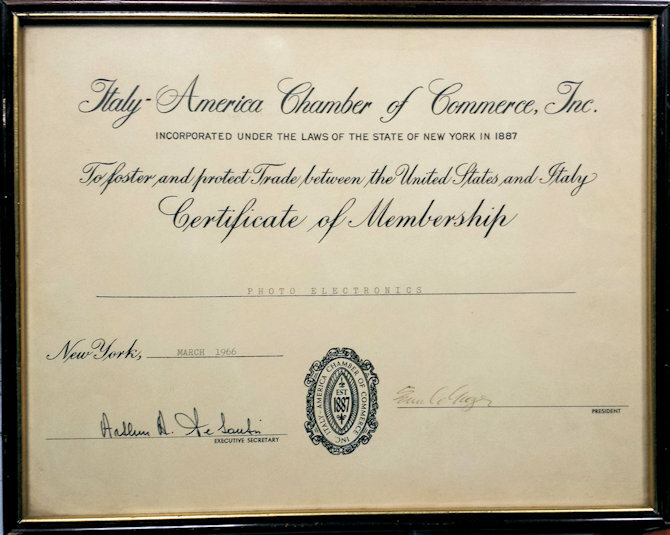 We proudly show the certificate of the Italian-American Chamber of Commerce in which we certify that we have been exporting to USA since 1966.. In the 90s the company LIGHTING Division started the production of electronic hot-restrike systems for the hot re-ignition of high-frequency discharge lamps and electronic ballasts for the power supply of discharge lamps. These products for outdoor lighting have been installed in stadiums and large areas. In the year 2000, the portable 400W flashlight, first hand-held UV lamp, was designed and manufactured for professional use as automotive or polymerization of adhesives, glues and varnishes. Subsequently, Photo Electronics supplies first IR (Infrared) then UV ovens, becoming the official supplier of the leading manufacturers in Italy of lines for the production of slabs, marble and conglomerate tiles (Breton, Pedrini, SIMEC) and their ovens are exported all over the world. Today, the CURING Division is the company main business, dealing with the production of ovens and UV/UV LED lamps for curing and polymerization of inks, resins and adhesives in industrial treatments. Today the company believes in the complete replacement of UV mercury lamps with the new UV LED technology, focusing on the production and development of innovative and flexible UV LED lamps known for their usability and modularity. We believe in the future development of UV LED in areas where it is not used yet. We want to expand UV LED technology in new applications, both in large volumes and in market niches where customized products are needed. We want to be a reference point for machine manufacturers and system integrators, creating new solutions thanks to our knowledge and expertise on UV LED technology. We believe in the teamwork together with chemical engineers, including producers of polymers, inks, varnishes and adhesives. We work closely with machine manufacturers, producers of chemical solutions and final users to achieve common goals and benefits. We guarantee quality and reliability over time of our products. We design and produce the main components completely in Italy. We respond to the specific needs of our customers with flexibility, providing customized products. We use our historical baggage in electronics and lighting fields as a solid foundation for product innovation. During its long life, Photo electronics has designed and produced equipment in many sectors. Discover all that we have patented, designed and built over the years.